Fit Cubes in Place in 3-D Space! 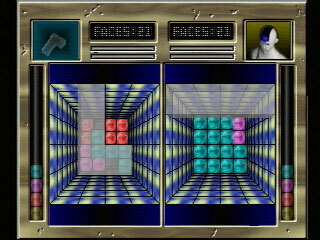 Enter the next dimension in puzzling excitement! 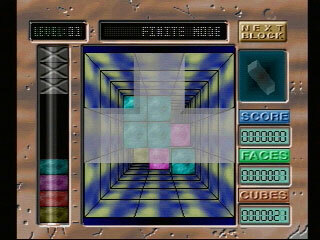 In Geom Cube you flip, flop and drop blocks in your customized three-dimensional playfield. 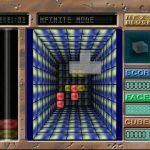 Duel a friend head-to-head or take on the devious computer-controlled challengers and claim the title of Geom Master! Transport your completed layers to your opponent’s playfield to make their task more difficult! Fast-moving Finite Mode, intense Infinite Mode or challenge the crafty CPU-controlled fighters! This has got to be the most bizarre copy cat project I’ve ever seen. 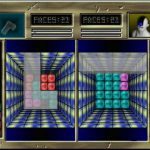 Usually when people were tackling each other to make the next great Tetris-clone, they stood back and basically changed a few visual elements. 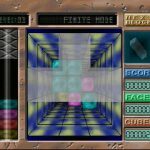 Puyo Puyo by example had you connect 4 of the same color, rather than form a line. 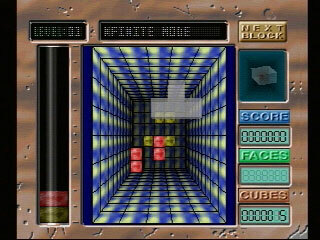 Geom Cube on the other hand goes for a literal perspective change; imagine playing Tetris as if you were at the top of the game field, looking down into the field. So now besides trying to “fill the gap” rather than the single line, you also need to keep a mental list of where pieces are in both space and height. If you accidentally leave a piece blocking an edge, you need to remember it’s there underneath your other pieces as they drop. Once you get several mistakes high, trying to repair the damage proves too confusing. There’s also not much in the way of variety with the sparse options, so if you can’t get used to the new view, you’re not going to enjoy anything about the game.